Constructivist Legend, Eleanor Duckworth, Coming to CMK 2013! 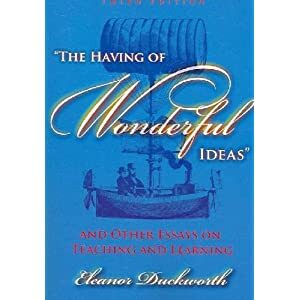 A former student and translator of Jean Piaget, Eleanor Duckworth grounds her work in Piaget and Inhelder’s insights into the nature and development of understanding and in their research method, which she has developed as a teaching/research approach, Critical Exploration in the Classroom. She seeks to bring a Freirean approach to any classroom, valuing the learners’ experience and insights. Her interest is in the experiences of teaching and learning of people of all ages, both in and out of schools. Duckworth is a former elementary school teacher and has worked in curriculum development, teacher education, and program evaluation in the United States, Europe, Latin America, Africa, Asia, and her native Canada. She is a coordinator for Cambridge United for Justice with Peace, and is a performing modern dancer.